With the feel of one big room, a 749-square-foot cabin in the Berkshires offers a comfy whole-family retreat. Cost was a factor in the design of the home, so the couple, who share the house with their two daughters, now 7 and 10, decided to create a structure that was small and perfect, says Todd. Fans of contemporary architecture, they sought a home with modern sensibilities that had the comfortable appeal of a cabin in the woods. They turned to Cambridge architect Maryann Thompson to help them achieve that vision. The plan called for a small footprint kept to one level. “We didn’t want something that would be too tall – we felt like that would violate the concept of being part of the landscape,” says Todd. Since the house was to be so compact, Thompson and project manager Evan Mathison experimented with different ways to divide the 749-square-foot space. Ultimately, the Golubs settled on a wide-open plan. “Essentially, the house is like one big great room,” says Thompson. “Todd and Martha decided to prioritize living space, so the two bedrooms were shrunk to be very tiny.” The two sleeping spaces are separated from the living area not by walls but by curtains, and the wall between the Golubs’ space and the one their children share goes only halfway to the ceiling. These design decisions make the house feel more expansive – the only drawback being that the parents are often awakened in the morning by the kids throwing things over the wall. But it’s all in good fun. “We’re lucky to have our kids enjoy being in the cozy space with us,” says Todd. 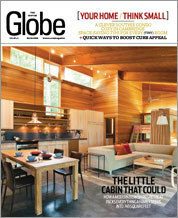 The kitchen is situated along one wall of the main room, says Thompson, which “enables the living and dining area to feel graceful and vast, like a big lodge.” Western red-cedar paneling on the ceiling and walls enhances the rustic vibe. Stained and polished concrete floors exude a smooth, contemporary appeal and stay cool in the summer. The house, which tucks into the hillside, nestling beneath the tree canopy with its roofline following the slope of the mountain, is oriented to the northern view of the valley and mountain range. Floor-to-ceiling windows and glass doors on the north side of the house capitalize on that view. Thompson wanted the house to have some southern exposure, too, so she designed clerestory windows located just below the ceiling’s highest point – 17 feet – to bring in light from above. The windows open and close mechanically, and, combined with skylights, ceiling fans, and low windows, enable cooling by the stack effect: Warm air is drawn up, and cool air is pulled in. A 300-square-foot screened three-season porch that contains a sleeping loft expands the living space. During the warmer months, large glass doors between the dining area and porch are left open, blurring the boundaries between indoors and out.